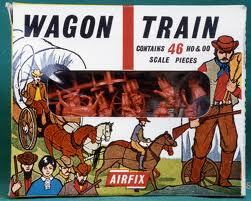 Today we review a old far west set, the Airfix Wagon Train. This is the first one, with a cartoon style box and a transparent plastic to see what you are buying. Finally, the modernization, this time a bit dark and plain, not very attractive at all. In terms of marketing, the second one is the best. Curiously the first two sets were considered as "HO-OO", that is, 1:76, but the later release considers it as 1:72. These figures are really 1:72, maybe not so tall as a Esci figure, but certainly not so small as a true 1/76, like Matchbox figures. This is a very old set and the detail is not very good, although you do have good anatomical proportions given. 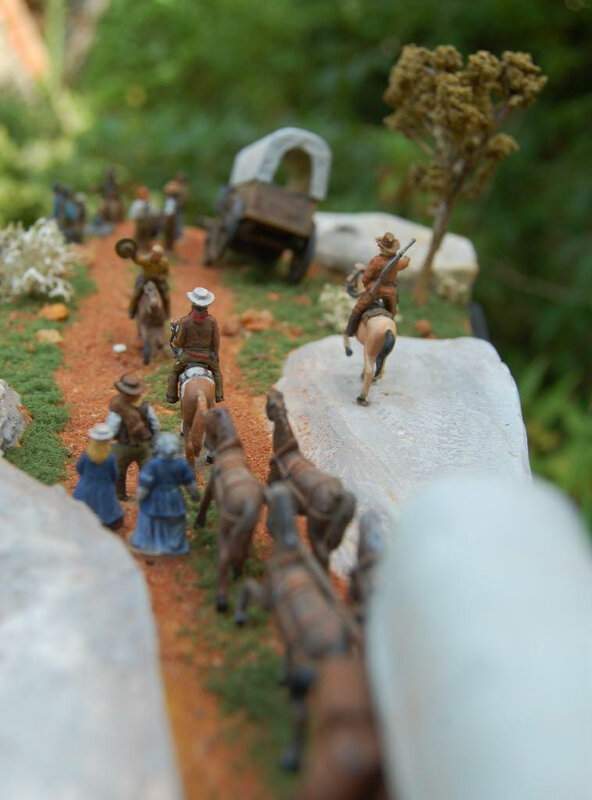 The poses are nicely made, and each figure has a lot of life and charisma. 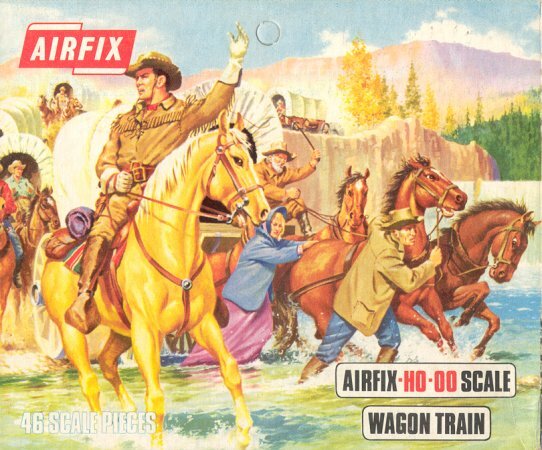 The worst comes with the horses, as Airfix never did get them right. The are small, plain and without detail. 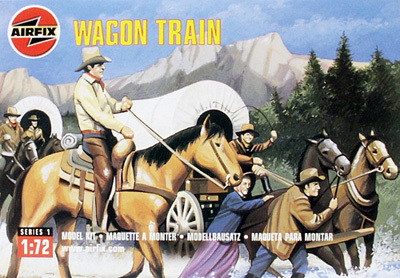 The wagon is not very good either, with general lack of detail and a cover very plain and badly made. The wheels seem to be too near each other, and gives a strange impression. Representing civilians from a period so near to us is quite easy, and I don't see anything that could be regarded as historically unaccurate. This set could be nicely used to represent Napoleonic civilians, WWI civilians, and even some WW2 civilians so it has plenty of good uses. With thousands of soldiers comes the necessity for a few civilians. 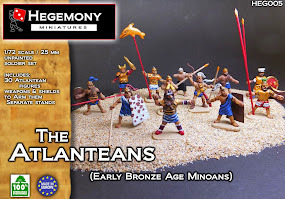 Not just that they can be great for dioramas,but also for representing the American civil war and war against indians, in which civilians and armed pseudo-civilians played a very important role, so this set is very much needed. The figures have a lot of character, each one has it's personality, like the man explaining a story holding his cup, the old man ready to eat, the man spreading seeds, etc. 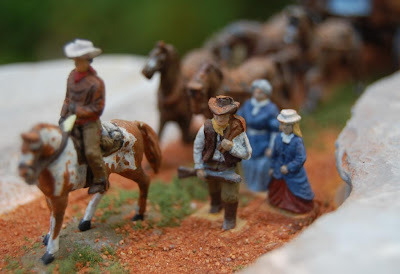 Maybe they lack some activity, as more than half of the figures are not marching, but all the same this is a fun set. Although they are not infantry, some of them can be used as irregulars for the American Civil War, and the wagon can be used for all Napoleonic battles (although I don't think that today anybody will buy this set just for the wagon). 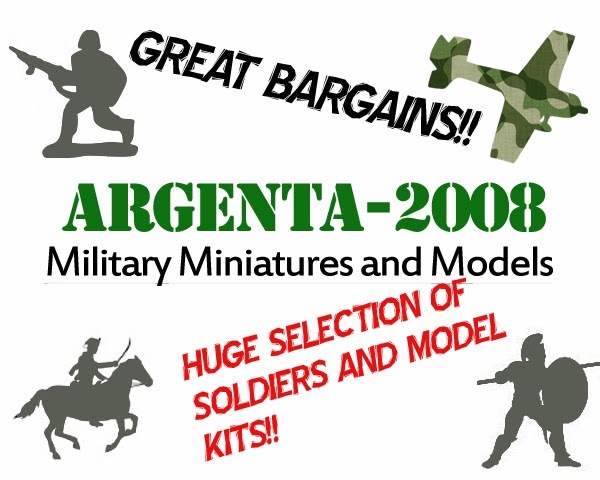 They have not been so reissued as it is normal with most Airfix sets, so they are a bit more scarce than usual, and sometimes go for 12 GBP or so on eBay. But if you are patient, you will find a lot containing them for 8 GBP shipped. Maybe you have trouble finding the carriage, as it get broken very easily, but considering it's quality, it is probably better to get one of another manufacturer and forget about the Airfix original one. They are made with a elastic plastic, very similar to other Airfix, but with a important problem; they tend to become brittle with age. Probably other Airfix sets of the time have the same problem, but as the other have been reissued massively in a better type of plastic this is not usually a problem. In this case, it can be serious, and most probably you will find them in the actual condition of the original elastic plastic, which is hard and brittle, good to paint and glue, but you will have to be careful handling them. This is a nice set, a very interesting addition if you are interested in this theme. If you like the Far West, you have to get this set. 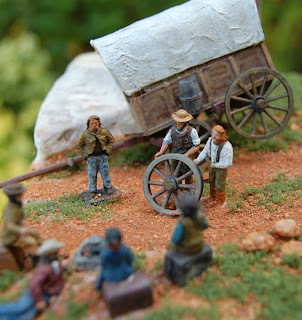 If you don't care too much about America in this period, maybe the price for just 19 figures and one wagon can look expensive and not worth it. 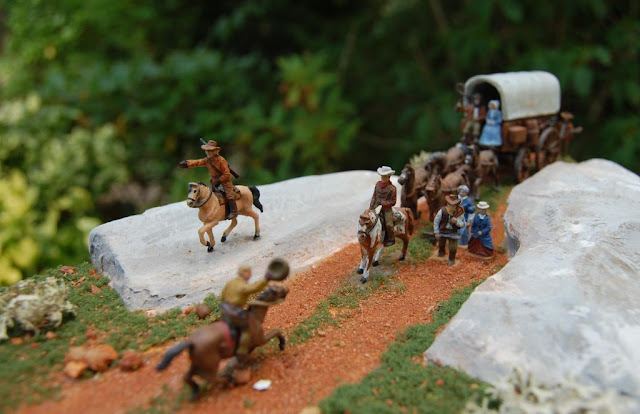 Another thing that affects this overall valoration, is that you can get the Imex American Pioneers where you get more quality and quantity for the same price, so you are just getting this set because you are either nostalgic, or you need more variety. I didn't see this post !!!! Always a very good review ! (note: I've added some figures from other sets and some are a little converted. Thanks to you, it has been a honour to use them :) . Yes, I saw that, but I forgot to say it. If you paint more soldiers, let me know, as the other ones you've painted I don't have them in my collection, and as a rule, I only review sets I have :P .
I'm not yet painting a full set because I need just some figures and not a whole set . The lonely recent set I've painted in the totality is IMEX "Lewis and Clark". 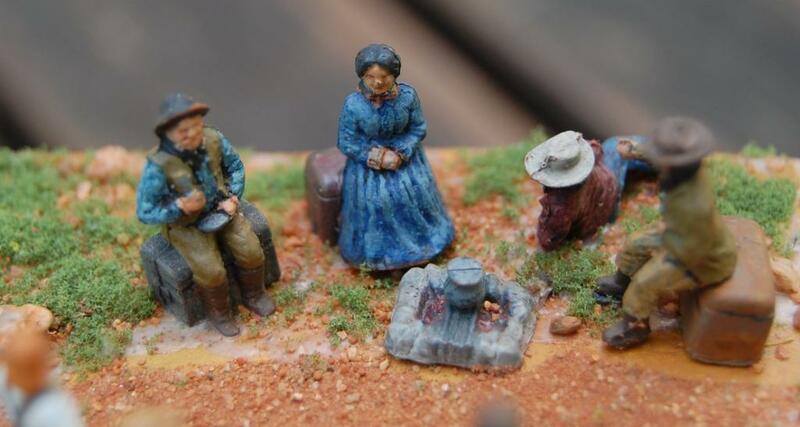 I will paint maybe IMEX "pioneers" and for the other, I don't know exactly! maybe some vikings from different sets, that's all what I can say at this moment! Well, just with one painted figure of each pose is enough :) . 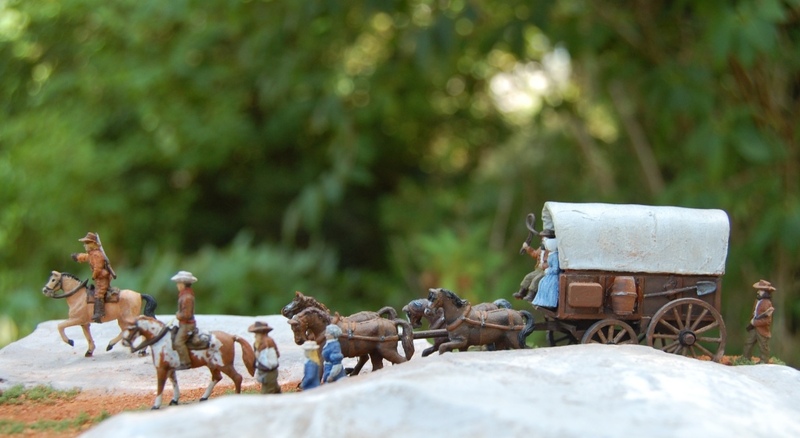 I still have to get my hands on the Imex Pioneers! Some of the Strelets Vikings would be very useful :) .